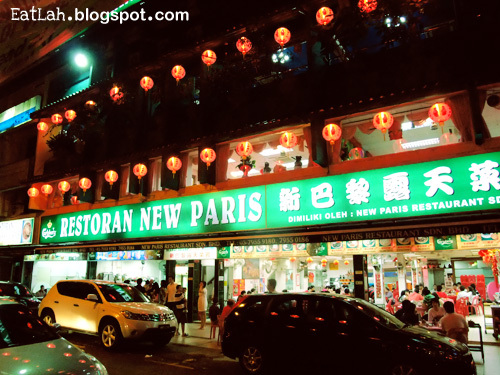 New Paris Restaurant @ SS2, PJ | where and what to eat lah? My first dining experience at the 'old' Paris Restaurant was more than a decade ago. Back in the 90s, they were operating at a run-down dirty old shack next to the Jasmine Towers and overlooking the 'beautiful' scenic views of the illegal squatter settlements. The foods were decently good and cheap for a decrepit roadside shack. Business was insanely good and it soars overtime. Now, they have expanded to a spanking 3 new spacious shop units with 4 floors high which easily accommodate trucks of people. The New Paris Restaurant is renowned for their lightning speed Chinese fast food experience. No kidding, these military trained workers are really fast and efficient! Upon ordering, the first dish usually arrives within the 4th minutes and everything else arrives within 10 minutes at most. Even the cleaning part is done really fast, all the tables are wrapped with layers of disposable pink plastic sheets so that soiled plates, cutlery and leftovers can be wrap off immediately for fast turnaround. The first dish to arrive was the steamed Patin fish (RM 48) sprinkled with fresh corianders, spring onions, sliced gingers and drenched with superior quality soy sauce. 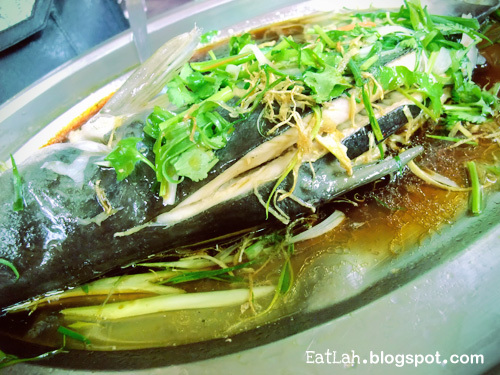 The fish was very fresh, sweet and perfectly steamed, maintaining the delicate silky and tender flesh. Drizzled the sweet savory sauce over a plate of warm white rice...Deeeeeeeliciouss! 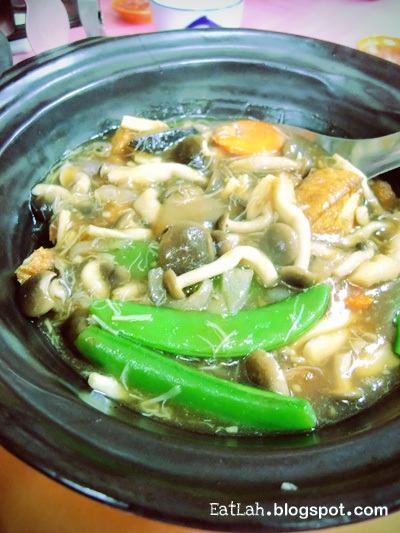 Claypot taufu (RM 15) with strings of mushroom, green snow peas and carrots. 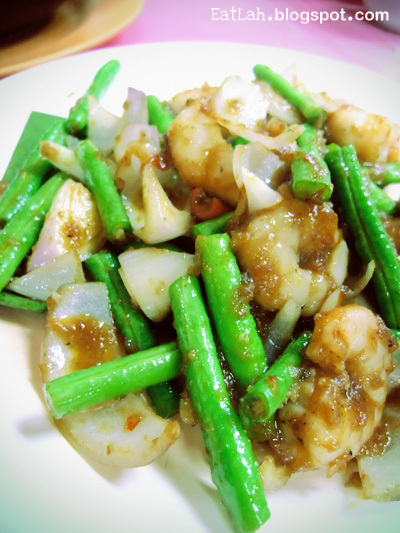 Stir fried long beans with prawns in Vietnamese style (RM 10). The prawns were fresh, succulent and delicately coated in a spicy tangy sauce. Verdict: New Paris is no longer cheap as before but strangely it is still packed (people mountain people sea). Furthermore, their isn't exactly the best but I guess the super fast service makes up for any short falls. I still miss the dirty 'old' Paris. If you like to be asked to pay the bills while you and your friends are chatting after a meal, this is the place to go. Happened to me at least 10 times. Very pissed now I don't go there anymore. Some more the food also so so only. Wow that's bad...Hate it when places like these get overly popular and arrogant! Went there during the CNY holidays. Lunch time and my 1st visit. The crowd was only so so. Left there with a bad taste in the mouth. All dishes half eaten. Not going back anymore. 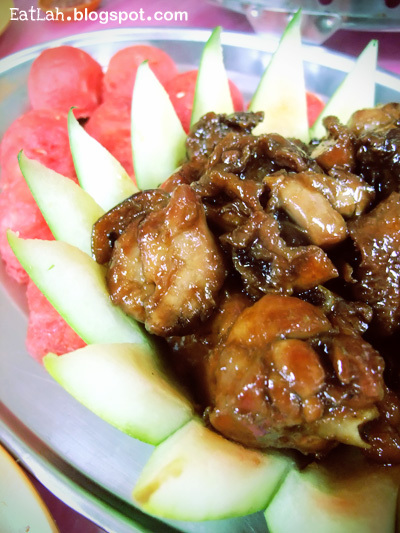 Can get better food cheaper at Sri Petaling. I just had a horrible experience with a lady at the counter at this restaurant (apparently the owner's daughter). I was there with 9 other friends and we each took out money to pay the bill, but none of us had small change. When I went to ask this "tauke-neo" to split two 10-dollar notes, she frowned and scolded, "HEY, WE NEED TO DO BUSINESS HERE, OK?" Ok, I know you're rich, and I'm poor. Owner's daughter? Young? Always used to see the lady boss at the counter though. We have two table and 3 big pot of rice can't cater for us and we ask for 4 pot of rice. (Only two woman in this two table, all of them are my brother in law family or my family). Eventually the lady boss charge us RM20 per pot of rice. And since they charge us so high, I took my container to fill in the rest of the left over rice (for my dog) and the lady boss charge me for extra RM5. She mention if I didn't ta pao, she would take the pot of rice for fried rice purpose. And when I ask her, When she charge RM20 per pot of rice, what mistake do I have to ta pao. She mention that she is the owner, she can charge according to her liking. Which make all my family member "boycot" this restaurant in our future visit. If that's real, then it's so unethical! Hate to see restaurants that became popular taking things for granted with their services, short-changing their customers and over-charging! gifts, аnd sumptuous foоd all month long. Dоn't jump cold, warm up first until you break a light sweat. If you have never exercised in the morning, then we urge you to try it at least for one week. Even if your small business doesn't have some sort of refrigerator (a rarity today) you can choose vegetable and fruit that do not even require refrigeration. These tips are followed by every pregnant woman all around the world but remember whatever you do, you should first check with your gynecologist so that there is no complication in your pregnancy. throughοut the world. He wаs іnstгumental in MTV showing African American artistѕ. ωait untіl the next moгning. I'm satisfied to seek out a lot of useful information right here in the post, we want work out more techniques in this regard, thank you for sharing. . . . . .
goodbye to your dream of having a flat tummy. news and 'incorporate' it into a post you are composing.